This week, Stephen Ibaraki, FCIPS, I.S.P., ITCP/IP3P, MVP, DF/NPA, CNP, FGITCA has an exclusive interview with Chris Labrador. 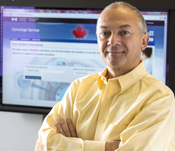 Christopher Labrador is Director of the Government of Canada's new Concierge Service program delivered by the National Research Council of Canada Industrial Research Assistance Program (NRC-IRAP). He has over 30 years of R&D and general management experience across voice/data, wired/wireless, as well as with telecom operators, SME, and Large Enterprises. He has led activities in the areas of research, systems engineering, systems/software architecture, software development, product management and marketing. He has published papers and articles in the areas of HMI, VoIP, mobile sensor networking, and has inventions in the areas of collaboration & convergence, security & authentication, distributed service & call processing, content delivery, and CASE. In addition to leading the Concierge Service program, his research interest areas include mobile health, sensor networking, coding, encryption, pattern recognition, data mining, augmented reality HMI, and free-space optical communications. :00:21: Chris, your outstanding contributions have significant global impact. Thank you for sharing your considerable expertise, deep accumulated insights and wisdom with our audience. "....I'm excited to be here today to share news about the Government of Canada's Concierge Service delivered by the NRC and looking forward to our discussion...."
:00:42: What is your current role and can you describe your new program? "....The National Research Council of Canada Concierge Service program was established to assist small and medium enterprises (SME) and entrepreneurs in finding relevant programs and services, understanding them to a degree where they can make decisions of whether or not they should pursue them, and making sure that the programs fit the needs of the business. Currently I am the Director of the Concierge Service program with overall responsibilities for its success and its evolution. The vision for the group is for us to be recognized as trusted expert guides and the premiere source of information that enhances the innovation and growth of SMEs and entrepreneurs that we serve...."
:03:03: What is the value to business and to executives? "....As a catalyst in forging prosperous relationships between businesses and partner programs, we shorten the time and energy it takes to get helpful resources identified and applied.....Rather than have SMEs start from scratch in an unfamiliar territory we help them find the answers they are looking for so they can focus on what they do best in running their business...."
:03:54: How will you measure the success of the program? "....One way to measure the program's success is by the increase in the partner program's utilization and ultimately the resulting success in the business is supported by creating a pipeline of clients for the programs to serve...."
:04:26: What is the value to Canada? "....If you think about it, Canada's economic growth is rooted in small and medium enterprises and helping this engine to achieve its maximum potential, Canada's benefits will be realized in economic prosperity and leadership in the enterprises that get us there...."
:05:30: What is your global expansion program and how will it be executed? "....Concierge Service is getting started in this area and we work with Canadian SMEs to help them take advantage of programs and services that open up global markets and assist them in competing abroad. This includes organizations like the Canadian Manufacturers & Exporters Association, as well as the Department of Foreign Affairs and Trade. We are working very closely with these partners to make sure that our clients and business customers can find those resources in order to get to those markets...."
:06:18: Can you describe the top resources in your program? "....I think that it's best to think of it from a federal, provincial and regional level initially, but quickly you find out that the services really span entire geographies across the country, even those that you might think are offered at a community level....There are leading provincial partner programs with significant regional programs as well. I won't get into them because as I said there are close to 100 of them, but I think it would be safe to say that at this time, Industrial Research Assistance program of the National Research Council (IRAP) is probably the most widely used program...."
:10:21: What will a typical engagement look like – what are the steps? "....The first thing you could do is visit the Concierge Service portal at http://concierge.portal.gc.ca (we also have a French website for the services http://guideexpert.portail.gc.ca)....The initial engagement would start off by you contacting us either through the website to get some information (and if you find that it's sufficient, to proceed on your own), or you can make a phone call or fill out the form online and be contacted by a concierge advisor. They will find out more information about you, collect some facts and information about what you are doing and then start to work with you towards identifying programs that may be applicable to your particular area, understanding the needs you are facing and seeing if we can match-make you with services and partner programs that can address those needs.....Once we've identified the types of things that can be used that will work within your business we then hand you off to a partner program....If you find that later on down the line you need some other assistance we are there to help you and because you've established that relationship, it's a lot easier to get started...."
:12:59: In industry you sort of live or die by your customer service. What's your quality of service and commitment? Do you have any kinds of measurements at all? "....Within 2 business days of being contacted, an advisor will reach back to you and help you get started. We also have service level commitments with respect to answering the phones. We have a national call center that is designed to address those needs. It is supporting the activities across the country and it also works closely with our IRAP colleagues. We have built a system around how we are going to service our customers' needs and if we find that we're not satisfying those needs to the degree that we've committed to we certainly would be making adjustments to address that...."
:14:19: How much funding support is available and can you overview the funding programs? "....With respect to the specific funding programs, Concierge Service doesn't, in and of itself, offer funding. There are many different programs which do that across a wide variety of sectors so money which might be available to somebody in manufacturing might not be available to somebody in an agricultural context or vice versa....The specific numbers for each of the programs that are available are not necessarily static; they change in a dynamic fashion and so to give you a number or a figure would be something that might be misleading, but I can tell you that if I were to add up all the figures it's definitely in the tens of millions of dollars across the board so there are a lot of opportunities out there for individuals to take advantage of these things...."
:16:23: What kind of training program are all your advisors going through so that they are aware of all the programs and all the opportunities? "....It starts off with the information officers who answer the phone for you – they are trained to effectively do a triage on the situation in terms of the kinds of questions that you're asking on the phone, and then will match you with appropriate Concierge advisors who are in the region for that individual or that SME....Training-wise we have constant outreach sessions where we are visiting with partner programs on a weekly basis, and where one Concierge advisor doesn't have the depth or information about a specific program we rely on each other to provide that assistance...."
:18:21: I guess the Concierge Service advisors can refer the executives to some of the various tax incentives and credits for research. What tax incentives exist and credits for research exist? "....Tax related support is typically handled by government programs that are in place today. For example, Scientific Research & Experimental Development (SRED) program gives claimants benefits in the form of refundable investment credit, a reduction in the taxes payable or both for their expenditures on eligible research & development work done in Canada. Our Concierge advisors can address some high level questions regarding the program, or more importantly they can assist businesses in connecting and leveraging this valuable resource...."
:20:55: Are there foreign ownership and investment restrictions and what are these restrictions? "....From a foreign ownership perspective, again it would all depend on the programs....I hope as you can start to see, Concierge advisors and the Concierge Service isn't detailed to the degree that they could replace any one of these programs, but we have enough knowledge to collect information from you and then to assess in working with our colleagues within Concierge advisor's programs (as well as with the programs themselves) to find out the applicability of the program and whether or not you meet the requirements that have to do with ownership or levels of investment or funding or the type of credits that you might get for tax purposes...."
:22:15: Can you describe some of your most significant and influential achievements and the practical outcomes seen today and forecasted into the future? "....One of the things that I've seen (from the standpoint of achievements that I've reached for myself and the teams that I've worked with, as well as where we are headed), is that the activities that we are involved in and the goals that we set for ourselves tend to be cyclical in nature. At the beginning of my career the contributions I made were in the areas associated with telephony and communication networks, and the kinds of problems that we solved there were about managing large numbers of clients or large numbers of devices accessing a network and taking advantage of services and this was accessing the telephone networks and taking advantage of telephone services. What I see 30 years later is the same kind of thing happening except it's not the telephone network, it's a wireless network or it's the internet, and from the standpoint of the observations and what I think is going to have an impact going forward, is that a lot of things that we're doing today have reflections in the past and for those of us that have been around and applied solutions and built systems to solve those problems....some of those things are going to come back in terms of assisting us in how we solve today's problems...."
:24:22: Your extensive leadership history is legendary, are there some leadership lessons you wish to share to help ICT executives in the audience? "....I think the first two important lessons to follow are to have a process and have the discipline to follow it. The next would be communication....The fourth is something that I think is really important and it is ruthless passion....From the standpoint of decision-making, I would say that pushing decision-making down in an organization as far as possible but no further really important....Maybe a sixth thought here, is the area of revision or refinement...."
:27:32: Past, present, and future, are there those out there who inspired you and why is this so? "....Folks from the past that inspire me are folks like Leonardo da Vinci or Benjamin Franklin....About the present, I am inspired by individuals like Elon Musk and Steve Jobs and Mike Lazaridis who created Blackberry....If I were to think about the future I'm inspired by individuals who are going to solve those huge problems that we're facing now....As I discover those individuals who are working on those types of problems I pay attention to them and I listen to what they have to say and I look forward to the kind of work that they are doing and the solutions that they will provide...."
"....I may have said this earlier but learning from your mistakes. The thing that surprises me the most is the thing that I see in myself from time to time but I also see it across the board with others and that is, in spite of all lessons and all the mistakes, people generally don’t learn from history. History does repeat itself...."
:30:43: What improvements in policy would you like to see happen in the next two years and what would you like to see internationally? "....In general I think that my answer to that question would have to be improved vision and execution across the board to a plan that deprioritizes short term gains...."
"....I think there are things other than simply computing knowledge that's required and that's the ethical side that pertains to what we do (the power that we have from a computing perspective), and in general I think that certification is probably a good thing, but it has to be done in a responsible way, not just necessarily saying that all people must be certified now but fundamentally that we have to look at how we ensure that the individuals that are getting trained meet the criteria that we’ve established and maintain that level of standard going forward...."
:34:30: From your extensive speaking, travels, and work, are there any stories that you want to share (maybe amusing, surprising, unexpected or amazing)? "....Something amazing that I can share with you is in thinking about the phrase 'killer apps' which people use very often, I think there was a time where that's all they talked about and what I've seen and appreciated is that after something is deemed and acknowledged to be a killer app it almost immediately becomes a killer enabler. The key part of my observation is that killer apps that don't embrace this transition, they often fall to irrelevancy...."
:37:14: You choose the topic area. What do you see as the top challenges facing us today and how do you propose they be solved? "....The cost of computing, identity theft issues and privacy I think are going to get a lot of attention in the near future..."
:40:51: If you were conducting this interview, what question would you ask, and then what would be your answer? "....If I were a partner program, how would I get engaged with the Concierge Service so that I could offer my funding, advice or my expertise, etc. to the pool of SMEs and businesses out there?...." :41:59: Can you provide an overview of what a partner would look like? "....A partner is an agency or a program (and as I've said we have them at the federal, provincial and regional level), that provides services to the community. They would be somebody that might have funding that they can provide, they might have expertise that they could deliver, they might have advice. Partners come in a variety of forms...."
:43:23: Chris, with your demanding schedule, we are indeed fortunate to have you come in to do this interview. Thank you for sharing your substantial wisdom with our audience. "....Thank you Stephen. I really appreciate this opportunity and I'm grateful I had the opportunity to share Concierge Service with you and your audience. I hope to hear from all of you and I don't mean that lightly. I hope that everybody that listens, who has a need, picks up the phone and gives us a call. The phone number is simply: 1-855-53Guide (1-855-534-8433) and that number is available on our website (http://concierge.portal.gc.ca)...."